Ok – I’ll be honest, not much going on in my blogging world this week. I’ve edited the first three chapters of the 58th NCT book, and I’ve finished the final chapter. I have about a half a chapter of analysis to do to finish chapter 14. I thought I would edit through the rest of the book before I go back to finish chapter 14. So, I’m not going to have much time to blog this week. I will be at the Christmas in July event this Saturday in Jefferson in Ashe County. Not much else going on. 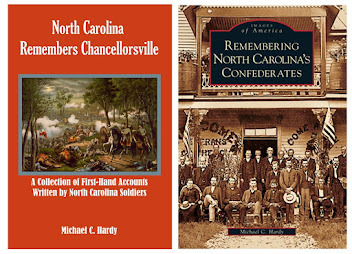 Someone asked me the other day what my interest in the 58th North Carolina Troops was – did I have an ancestor in the regiment? No, I’m not a descendant of a soldier who served in the 58th NCT. I am distantly related to several of the men, like Lt. Col. William W. Proffitt (and any other Proffitts in the regiment), the Laws in Companies G and K, and the Hamptons in Companies C, M, and G. Distant as in those are cousins several times removed. So what interests me in their story? I guess it is their story, a story that needs to be told. 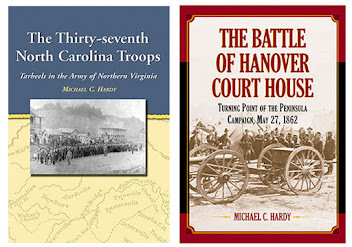 Research into the lives of North Carolina regiments that served outside of the state, or outside of the Army of North Virginia, is woefully lacking. I hope to fill that hole with this book. Also, I’ve had a couple of run-ins with different members of the regiment. No, I really don’t believe in ghosts, so let me explain. Growing up in central Florida, I used to traverse Palmer Avenue there in old Winter Park. The road goes over Palmer Creek. Little did I know then that what I know now: that Palmer Avenue and Palmer Creek are named for Colonel John B. Palmer of the 58th NCT. Since 2001, I have lived four or five miles from where Colonel Palmer lived from 1858 until 1864. So twice in my life I have lived close to where Colonel Palmer lived. Of course, I hope this trend does not continue. I have no desire to live in Detroit, or Columbia, or even upstate New York. At a re-enactment once I got to meet and talk to the granddaughter of General Westmoreland (I don’t even remember her name – sorry, Dear!). That would be William Childs Westmoreland. The young John Eben Childs of Company H of the 58th, the one killed at the battle of Chickamauga, was Westmoreland’s great-uncle (I think I have that right). I also got a chance to meet Clayton Stamey six or seven years ago. Clayton was the son of Elias Stamey, a member of Company A of the 58th North Carolina. He was a little over 100 years old when I met him. Clayton was in an old folks home in Marion, and I talked with him for about half a hour about his dad and even Colonel Palmer. The Palmers and the Stameys were neighbors. The chance to sit down and talk to someone whose dad was a Confederate (or Union) soldier is almost gone. There is not time nor space to make mention of all of the great descendants of members of the 58th NCT that I have run into over the years. They have told me their family stories, and on occasion, allowed me to hold artifacts that their family has passed down since the War. It is an incredible honor to be the person to have chronicled the story of the 58th NCT. So maybe I should give you an update on the project. I’ve decided to include two more chapters. These chapters were originally going to be a part of the appendix, but I have decided to bump them up into the chapter area. Chapter 14 will provide an overview of the regiment, its strengths and its weaknesses, namely desertion. I’ll compare the regiment to other regiments and talk about why desertion was such a problem. I could never really find a place to work this into the chronological history of the 58th NCT that I have written. This chapter has been started, and should not be too long. The last chapter, Chapter 15, is entitled “Looking for the Fifty-eighth Today” and is a brief look at some of the places the Fifty-eighth North Carolina fought during the war. This chapter is maybe 2/3 finished, maybe a little more. The entire project should come in at around 130,000 words. For those who have my book on the 37th NCT, that project was 150,000 words. So, that is where I am – trying to finish these last two chapters and trying to go back through and integrate some materials that I did not have I wrote earlier chapters. Then the big edit starts, maybe the first of next week. Not much going on in the news as of late pertaining to North Carolina the War. Here are a couple of articles that I did find. There is an article on WARL.com about a dive on what’s left of the USS Monitor, which sank off Hatteras in 1862. The turret of the Monitor was raised a couple of years again, and is now being conserved. Check out the article here. There is an article in the Mooresville Tribune about the placing of a VA grave marker on the grave of a prominent Statesville lawyer and militia officer. The man’s name was E. Haynes Davis. I didn’t think militia officers were eligible for government markers. Check out the article here. I come up with 2,021 men in the 58th NCT. Does anyone have a larger North Carolina regiment? Email me (mchardy@michaelchardy.com) or post a comment. Thanks. It is not so much that Harper’s parole is not there. What bothers me is this: how many other men from the 58th NCT were present to receive their paroles but have slipped through the cracks like Harper? How many of those that are listed as “No further record” after August 31, 1864, were present on May 2, 1865, to receive their paroles? I’m just bothered… I don’t like so many loose ends. 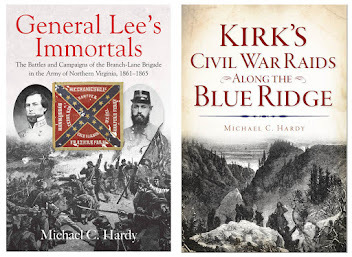 One of the things I included in the last chapter of both the 37th NCT book and the 58th NCT book is a brief description of the United Confederate Veterans. I also include UCV Camps from the area where the original regiment originated. For the 58th NCT, that includes the Nimrod Triplett Camp 1273 in Boone, the General Pender Camp 1154 in Burnsville, the Col. John T. Jones Camp 952 in Lenoir, and the Confederate Veteran camp 956 in Marion. As I scrolled through the list, I came across several Camps located in towns in North Carolina with which I was not familiar. Granted, I have not been every where in North Carolina, but I do get around. Camps that I was not sure just where they were include the H. L. Wyatt camp in Bayboro (Pamlico County); the Confederate Veteran Camp 1237 in Charm (I could not find this in Gazetteer, anyone know? ); the Confederate Veteran Camp 1155 in Elrod (Robeson County); the E. B. Holloway Camp 533 in Independence (could not find this one); the Mexico Camp 650 in Mexico(ditto); the Ryan Camp 417 in Red Springs (Robeson County); the Alfred Rowlan camp in Rowland (Robeson County); and the Confederate Camp 417 in Ryan (could not find this one).Interestingly, in 1901 there were two camps in Franklin (Confederate Veteran Camp 955 and C. L. Robinson Camp 947) and two camps in Salisbury (Fisher Camp 309 and C. F. Fisher Camp 319). Probably the best name for any camp was the camp located in Cherokee, the Sou-Noo-Kee Camp 1268. The Camp Commander for Camp 1268 is listed as Sou Ate. I’m working hard on the 58th NCT this week, so not a lot of time to get other things (like blogging) done. Here is a quick look around our beautiful state. 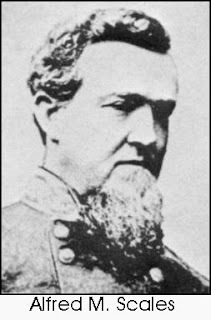 From knoxnews.com we find an interesting article about a diary from a member of the 104th Ohio that includes information on Sherman’s march into North Carolina. Check it out here. The Star News Online has an article about sunken ships along the Cape Fear. Read all about it here. 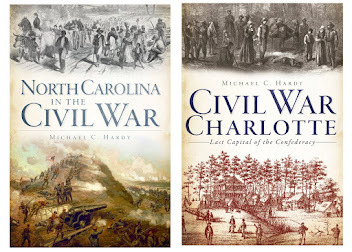 An article describing honors being paid to Historian Daniel W. Barefoot can be found here. The battle of Bost Grist Mill reenactment is this weekend. Check out a press release here. Folks – sorry for not posting in the past couple of days. We were participating in a living history at Cranberry (Avery County) on Friday and Saturday, and then drove over to the reenactment in Jonesville, Virginia, on Sunday. 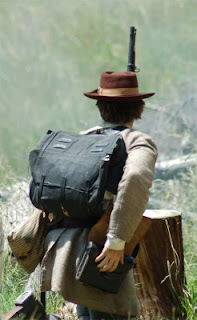 I had “reenactor lag” yesterday – those who don the blue or gray understand. The living history at Cranberry was held in conjunction with the Avery County Heritage Festival. While there I did pickup two War related books. The first is volume 8 of Lloyd Bailey’s The Heritage of the Toe River Valley. This is the first of three proposed volumes on the WBTS and the Toe River Valley. I've been through the book twice “mining” for information for the 58th NCT project and was able to come up with a few additions. The Toe River books that Dr. Bailey puts together are neat, but are very family oriented and are not for the casual reader. They also cost about $75 each. 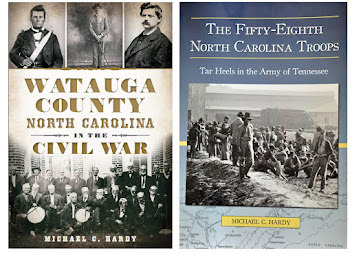 The second book that I picked up was a new tome edited by Rebecca (Becky) Alghrary entitled George Rabb: The Civil War Memoir of a Catawba County Tar Heel. I’ve not read this small hard back book yet, but it looks interesting. Rabb served in the 12th North Carolina State Troops. I did work on the 58th NCT book some yesterday. I have about three more “parts” to this last chapter, and then it is finished. Of course, there will be a lot of editing, caption writing, map drawing, etc., left to go, but the end is in sight. I’m off this afternoon to speak to the SCV Camp in Rock Hill, South Carolina. If you are around, stop by and say hi! The tenth (I think) Avery County Heritage Festival is this weekend, held this year in beautiful downtown Cranberry, on the grounds of the old Cranberry School. This is the site of the North Carolina Civil War Trails marker we put up last year. They mined iron ore at Cranberry during the war, and the property was owned by Robert F. Hoke after the war. We will be setting up a small encampment on the grounds and there will be several authors (me included) and other historians on site. The weather looks great, and if you are in the area, come on out and join us (10:00 am until 4:00 pm). Good morning folks! I received this email yesterday evening from the folks at the North Carolina Department of Culture Resources. It seems that our friends in the 26th NCT Reactivated are not only raising money for the preservation of the flag of the 58th NCT, but are also now working on the flag of the 52nd NCT. Check out the press release below. The N.C. Museum of History in Raleigh is home to one of the nation's largest collections of Confederate flags. However, conservation of these banners requires expensive, specialized textile treatment. To help fund this need, the museum has formed a thriving partnership with the 26thRegiment N.C. Troops, Reactivated, the state's largest Civil War re-enactment group. The 26th Regiment recently unveiled the second flag it has helped conserve: the battle flag of the 52nd Regiment N.C. Troops. Carried into the Battle of Gettysburg, the banner was captured during the Pickett-Pettigrew-Trimble charge on July 3, 1863, by a soldier from the 14th Conn. Volunteers. The regiment's colors were sent to the U.S. War Department in Washington, D.C., and returned to North Carolina in 1905. It is currently on exhibit in A Call to Arms: North Carolina Military History Gallery. "Our goal is to be able to raise enough money each year to restore at least one battle flag from the museum's collection," says Skip Smith, colonel of the 26th Regiment. "Simply put, we feel it is our duty to preserve for future generations these battle flags that guided many a Tar Heel boy. "The organization's first flag project resulted in conservation of 26th Regiment N.C. Troops' colors that were captured at the Battle of Burgess' Mill near Petersburg, Va., on Oct. 27, 1864. A third banner is undergoing conservation, and funds for a fourth flag are being raised by the group through a statewide grassroots effort. "We are most grateful for the conservation funding provided by the 26th," says Tom Belton, curator of military history. "Their help is more essential than ever." Each flag costs approximately $7,500 to conserve, and the 26th Regiment is covering the entire cost. 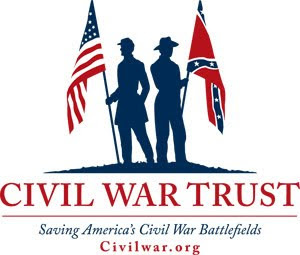 Now other Civil War remembrance organizations are joining the 26th Regiment by adopting additional museum flags for conservation projects. The 52nd Regiment, part of Brig. Gen. James Johnston Pettigrew's Brigade, suffered most of its losses on July 3, the final and bloodiest day at Gettysburg. The regiment had 46 men killed in action and 64 wounded. Another 140 were wounded and captured, and 91 nonwounded soldiers were captured. "There are many members in our unit who had ancestors in the 52nd Regiment who fought under this flag during the Battle of Gettysburg," adds Smith, whose organization believes conserving battle flags is the best way to leave something behind for generations to follow. "Although we could raise money to restore a uniform coat, it would only honor one person," he states. "A battle flag, on the other hand, represents the whole regiment and the sacrifices of all the men who marched under the folds of that flag. We are proud to partner with the North Carolina Museum of History to preserve these important artifacts." The colors of the 52nd and other regiments are being conserved in preparation for the N.C. Civil War Sesquicentennial. 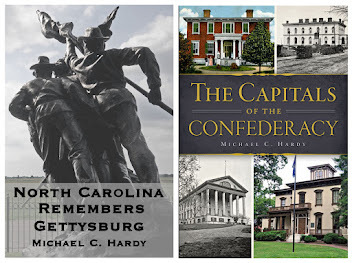 From 2011 to 2015, the N.C. Department of Cultural Resources will be presenting programs in commemoration of the 150th anniversary of the Civil War in North Carolina. It’s been a while since I posted one of my county histories. So, I thought this morning, we would look at Rockingham County. Rockingham County, located along the state’s northern border, was created in 1785 from portions of Guilford County. The county was named for Charles Watson Wentworth, the Second Marquis of Rockingham, a member of the British Parliament who advocated American independence. The county seat is Wentworth, named for the marquis, and was incorporated in 1799. In 1860, Rockingham County had a total population of 16,746 people, including 6,318 slaves and 407 free persons of color. In the 1860 presidential election the county cast 1,017 votes for Breckinridge, 485 for Bell, and162 for Douglas. When the time came for the proposition of calling a state convention to consider the question of secession in February 1861, Rockingham County voted 808 to 570 in favor of the idea. Representing the county at the secession convention in May 1861 were Dr. Edward T. Brodnax, a War of 1812 veteran and a representative in both the state house and senate. The other Rockingham County representative was former North Carolina governor David S. Reid. Besides serving as governor, he was also a state senator, a representative in the US House, a US Senator, delegate to the Peace Congress, and a member of the Confederate Congress. Companies from Rockingham County include Companies H, I, and K, 13th NCST; Company G, 14th NCST; Company L, 21st NCT; and Companies A, D, E, F, G, H, and K, 45th NCT. While Rockingham County saw no large troop movements, or pitched battles, there are numerous points of interest. Alfred M. Scales, a Confederate b rigadier general, was born in Rockingham County in 1829. Scales was a lawyer and represented his area in the state house in 1852 and 1856, and in the US House in 1857. During the war, Scales served as colonel of the 13th NCST, and was promoted to brigadier general on June 13, 1862. His brigade consisted of the 13th, 16th, 22nd, 34th, and 38th NCT regiments. Following the war, Scales continued to practice law and served again the state house, and in 1874, in the US House, where he remained until 1884, when he was elected governor of North Carolina. He retired from politics in 1889, and served as president of Piedmont Bank in Greensboro, and as an elder in the First Presbyterian Church of Greensboro. He died in 1892 and is buried in the Green Hill Cemetery in Greensboro. There is a historical marker off NC 87 that talks of his birthplace. Another point of interest is a home, located two miles east of Madison, in which in 1847, Stephen Douglas married Martha Martin. The local family connection did not seem to help Douglas carry the county in the 1860 presidential race. Rockingham County was also the birthplace of Thomas Settle, Jr., in 1831. Prior to the war, Settle was a lawyer and served in the NC House in 1854, and in 1858, became speaker of the house. He was also on the board of directors of UNC (there was only one at the time). 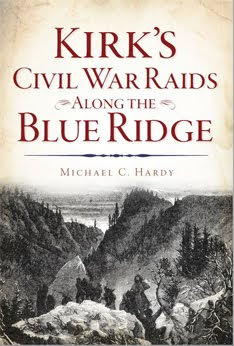 During the war, he served for a year as a captain in the 3rd North Carolina Infantry. After the war, he was a member of the 1865-66 Constitutional Convention, and in the fall of 1865, was elected to the NC Senate, where in he was elected speaker of the senate. He soon became one of the leading founders of the Republican Party in North Carolina. He was elected an associate justice of the state supreme court in 1868, and then in 1871, served as ambassador to Peru. In 1872 he was back in North Carolina where he was appointed to fill a vacancy on the supreme court bench. He tried twice to run for governor, and was defeated the last time by Zeb Vance in an election known as “The Battle of the Giants.” Afterwards, Settle was appointed to a US District Court as a judge in Florida, serving until his death in 1888. He is also buried in Greensboro. Surprisingly, Rockingham County has fully embraced the North Carolina Civil War Trails Marker program. The county has seven markers in the county, denoting Scales’s law office; the important rail link over the Dan River; Annie Eliza Johns, a nurse in the hospitals in Danville, Virginia; the Leaksville Cotton Mill; and the Wentworth Cemetery, among others. You can check out the list here.